I learned how to paper piece many years ago from Carol Doak’s 1997 classic “Show Me How to Paper Piece”. It was, at the time, seemingly a lot of work and I particularly hated pulling off all of the bits of paper from the back of the finished product. I put away paper piecing and swore I would never do it again. But then my recent desire to learn how to make a Mariner’s Compass design had me revisiting another book in my collection, Judy Mathieson’s “Mariner’s Compass Quilts: Setting a New Course” from 2005. In this book, Judy uses a different approach to foundation piecing using freezer paper instead of regular paper. 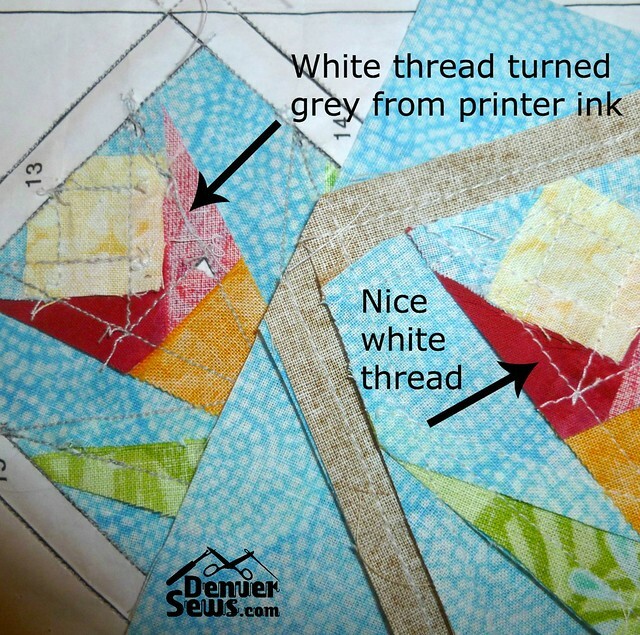 I tried this approach and found that it was much easier and faster to do than regular paper piecing. Since then, I’ve done a lot of foundation piecing with freezer paper and find that it just makes me happy. Foundation piecing, in any form, is like paint-by-number or putting together a jigsaw puzzle that I know I can finish. It’s something I like doing and that I know I can complete successfully. Now that I’m comfortable using freezer paper, I realize that almost any paper pieced design can be sewn with freezer paper. The exceptions may be those designs that are particularly small. There are many, many books and collections of paper pieced designs to choose from. 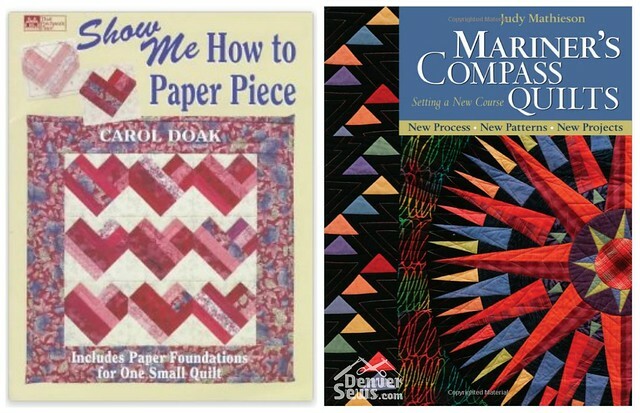 Carol Doak, in particular, has published numerous books of paper pieced designs. They are some of my favorites. 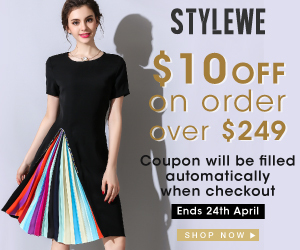 She has a Yahoo group dedicated to sewing her designs, new and old. Many of Carol’s fans are truly dedicated to using regular paper for their foundation work. The discussion of the use of freezer paper is practically not allowed in the Yahoo group. Surely I must be missing some finer points about the superiority of using paper. 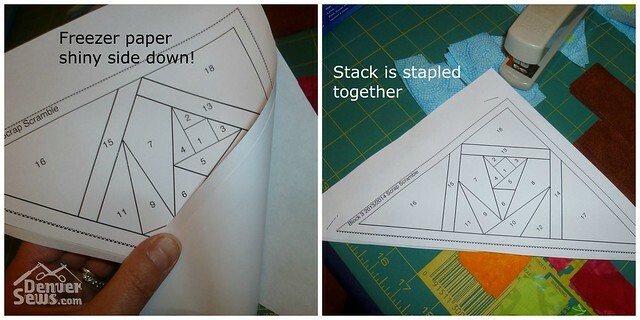 To this end, I decided I would revisit paper piecing and compare it to foundation piecing with freezer paper. I prepared the freezer paper templates by first making a stack of freezer paper sheets, cut to the appropriate size and stapled (or pinned) underneath a full size copy of the paper design. Keeping in mind that the sewn design will end up being the reverse of the printed design, I make sure that the shiny side of the freezer paper is facing downwards or away from the paper design on the top. The back sides of the fabric will be sticking to the shiny side of the freezer paper, much like the paper (in paper piecing) ends up on the back side of the finished design. I then stitch through all of the design lines, perforating the freezer paper. Don’t thread your machine, of course, to do this. Each freezer paper template can be used multiple times, so you do not need one for each block you are going to sew. Now to put the block together, start with the 1st fabric piece and iron it to the freezer paper. I have a small Clover Mini Iron which is perfect for this sort of thing. Though the photo shows me ironing the fabric to the freezer paper, it’s actually more effective to iron from the freezer paper side. 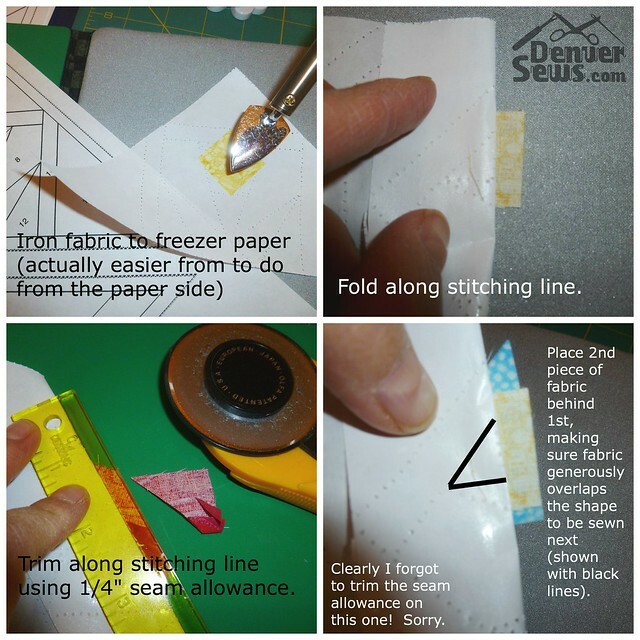 Then fold the freezer paper template along the first sewing line and trim the fabric leaving a 1/4″ seam allowance. I have a CM Designs Add-A-Quarter ruler for this step. It has a nice lip that butts up against the folded paper. Then take the next piece of fabric and place it right-sides-together against the fabric you just trimmed. Be sure that the new piece of fabric completely covers the shape it is supposed to fill. Holding all of this together, stitch along the edge of the folded freezer paper. You can start stitching about 1/4″ before the start of the seam line and finish about 1/4″ after. Repeat this process for each additional piece of fabric, taking care to add them in the right order. When you are finished, trim the edges of the block and peel off the freezer paper. Now let’s try paper piecing the same block. 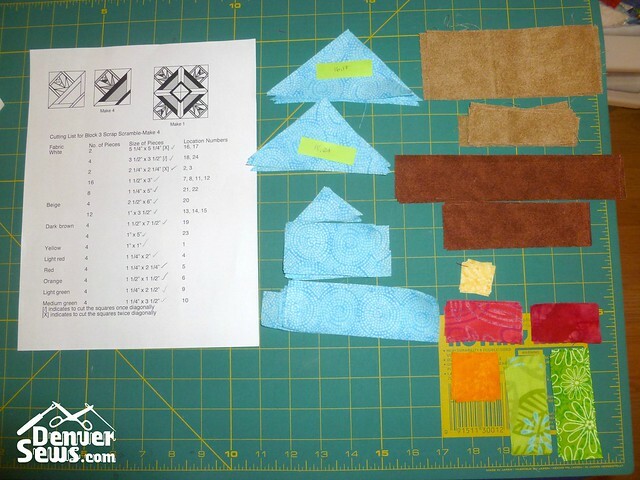 You will need one copy of each design for each block you will sew. You can use specialty paper or just regular printer paper. I used special paper from That Patchwork Place and printed directly onto the paper with my ink jet printer. 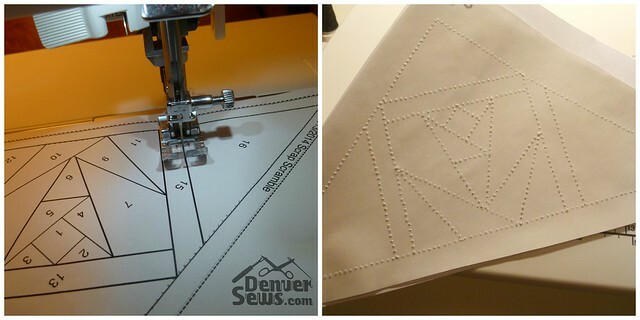 Start by setting the stitch length on your machine to a really small stitch. This will make removing the paper easier later on. Pin the first fabric piece onto the back side of the paper design. Align the pin so that it is parallel to the first sewing line. 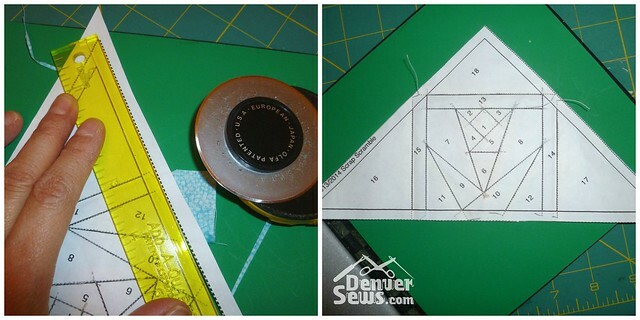 Take a sturdy card and fold the design over the first stitching line and trim the fabric to 1/4″ seam allowance. Now add the 2nd piece of fabric to the back side of the 1st, right-sides-together. Make sure that the 2nd piece overlaps the shape that it’s meant to cover. These steps are identical to those used with the freezer paper. Now unfold the paper and stitch through the paper and fabric. 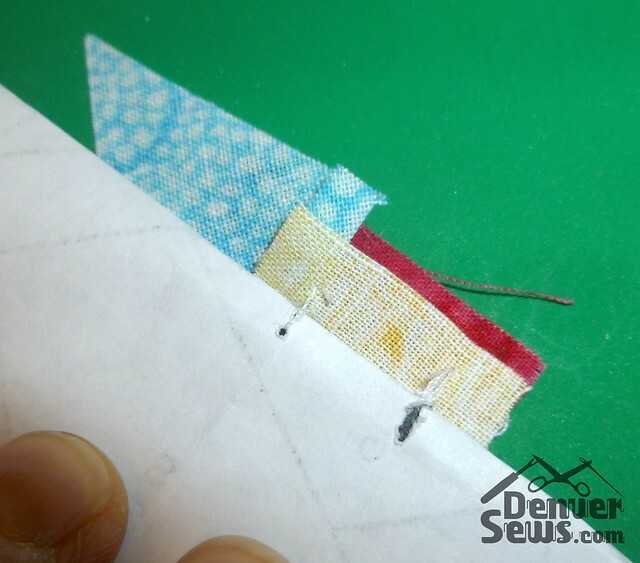 Remove the pin and trim trim the seam allowances just like with the freezer paper method. Open up the seam to the right sides and press. Continue the same process with each remaining seam. After the block is complete, trim the edges. Keep the paper on the block for now. 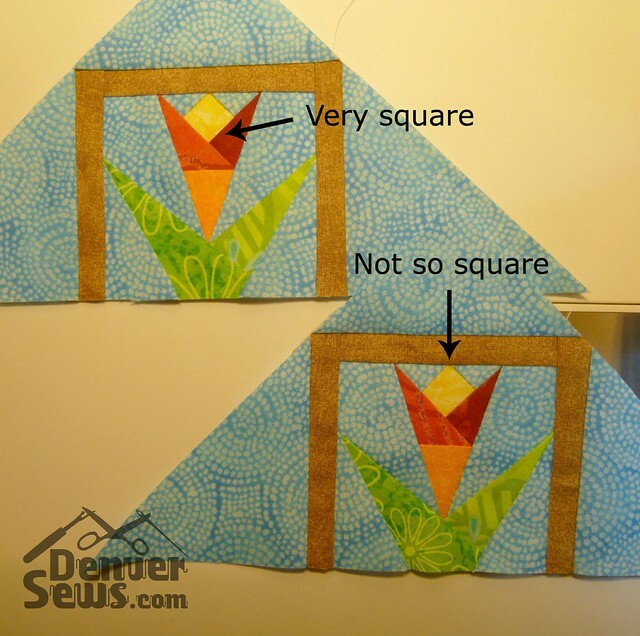 After your blocks are completed and sewn together, remove the paper with tweezers. If you remembered to keep your stitch lengths short, this should not be much of a problem. First, I will start with the problems I had with paper piecing. The biggest had to do with the fabric getting folded over under the presser foot without my knowing. I would end with a mess that needed to be sewn again. I did find that I could place the fabric under the presser foot with the paper folded over, then carefully unfold the paper, rolling it under the presser foot. This worked, but it was a pain. I also disliked having to carefully tear the paper when I had extended my seam lines and needed to trim the fabric for the next step. There’s no getting around this. The overall results, however, were very clear. My paper pieced blocks were much more precisely sewn than my freezer paper blocks. So if precision is the goal, paper piecing is the way to go. However, the precision has to be weighed against the simplicity of the process with the freezer paper. I found that using freezer paper was much faster and simpler. I didn’t have to worry about the fabric folding over under the presser foot because I could see the fabric as I sewed it. And I could reuse my freezer paper patterns! If I had any problems with using freezer paper, it would be that if the fabric was light colored, I could not always see the edge of the freezer paper very clearly and would sometimes sew over the freezer paper ever so slightly. 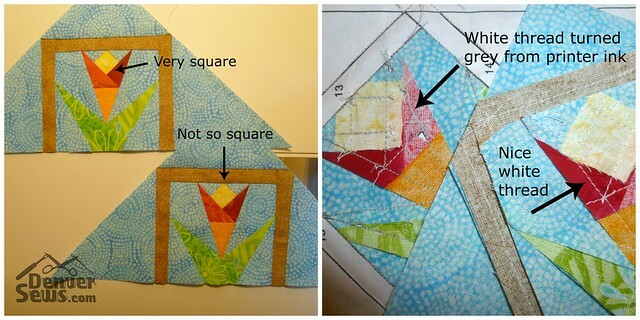 I almost decided to switch to paper piecing for its precision when I turned over my two sample blocks. If you look carefully at the white thread I had used, you can tell that the some of the printer ink had transferred to the thread when I used paper piecing. This is worrisome to me as I don’t know how that ink may spread if I were to wash the block. I saw no evidence that the ink had transferred anywhere else, but this ended up being the straw that broke the camel’s back. For me, the winner will remain freezer paper! I am not a perfectionist so I will happily trade ease of sewing for some precision. For all the reasons you stated I dislike paper piecing also… but there are some blocks that just need to be done that way. That being said the step you do when you stitch the pattern without thread is what I do for regular paper piecing so that I have “copies” without ink and it makes it easier to tear out the little buggers. I like to foundation piece on fabric on which I have printed the whole block on my printer. I iron a piece of muslin to a piece of 8.5 x 11 ” freezer paper and print the block with all its pieces and numbered order on the fabric side. I then sew directly to the muslin after removing the freezer paper. The freezer paper cannot be used again in this method, but I get very precise results. Of course that 1/4 ” presser foot helps a lot. And living in FL, many become summer quilts with pieced top, foundation muslin middle, and a lightweight backing (no batting). For those of you who hand quilt, the other drawback is the extra layer to have to stitch through. But I’ve never had any problem with machine quilting my muslin foundation blocks. I wondered why the white on my block looked a little dirty – – probably from the printer ink. I just ordered freezer paper online and will try your method as soon as it arrives. Thank you for your posting. There’s always more than one way to skin a cat! I came here from Craft Gossip. I have done lots of paper piecing but will now convert to the freezer paper method. The first block I want to try is a paw print. I want to make a wall hanging for a wild animal rescue group but the paper piecing was too much work. 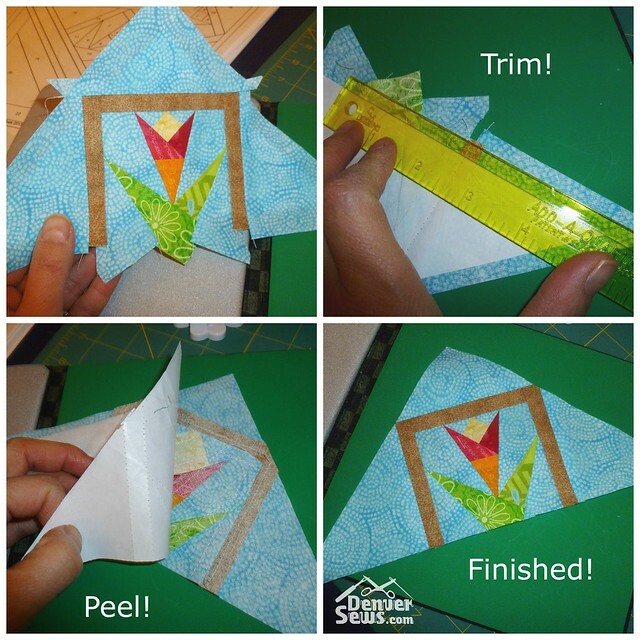 wow i have not see paper-piecing done this way! The way i learned was that you sew “on” the line not fold the paper back and sew. I think i like your way a bit better, no sitting and tearing out the paper on the back when your done. Wowza is that a thorough explanation. Thank you so much for all the work you put into it. Its been a long while since I paper pieced, because I found working the paper so annoying, but the freezer paper method is appealing. 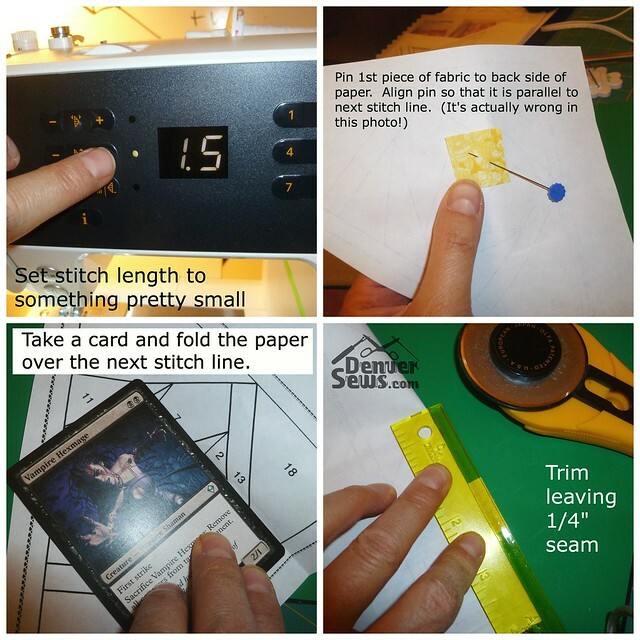 I’ve submitted your tutorial and review for posting on Craft Gossip, hopefully others will find it super helpful also.